Borut Božič (born 8 August 1980) is a Slovenian professional road racing cyclist. Considered a sprinter in the mold of Óscar Freire, Božič's career highlights include winning the 2007 Tour de Wallonie, victory in the first stage of the 2009 Tour de Pologne (plus two days in the leader's jersey), winning the sixth stage of the 2009 Vuelta a España, and 1st in stage five of the 2011 Tour de Suisse. 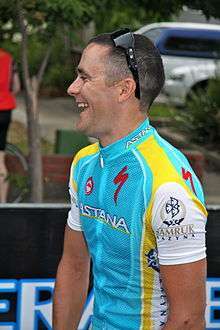 Božič turned professional in 2004 and currently rides for Astana. Born in Idrija, Božič got his start in cycling at age 10, despite growing up in a family with no connection to the sport. Though his friends cycled, his dad was a football player – so he looked to his compatriot Valter Bonca for inspiration. Božič is married to Klemintina, with whom he has a son, Sas. The family resides in Idrija, Slovenia. During the first three years of his career, Božič also trained for skiing, though by age 24 he realized he could make a living as a professional cyclist. Božič turned professional in 2004 with Perutnina Ptuj. He moved to the Italian Team LPR in 2007, but left for Belgian squad Cycle Collstrop in 2008. Božič's most successful season to date was 2009, his first with Vacansoleil, which he finished by taking third-place in the Paris–Tours classic behind winner Philippe Gilbert and runner-up Tom Boonen. Božič escaped with the two Belgians with 7 km to go, at the base of the Côte de l'Epan after an attack from Gilbert's teammate Greg Van Avermaet. Having led the trio into the final 300m on the Avenue du Grammont, Božič attempted to contest the sprint, but he was gapped by Gilbert with 150m to the line, and cut short his effort. After extending his contract with Vacansoleil through 2011, Božič was able to train calmly during the winter, and he resumed his winning ways in 2010. Božič claimed stages 1 and 2 of the Étoile de Bessèges in France, and placed second on the third. He started the fourth stage as leader of the general classification, but lost over 20 minutes to eventual race-winner Samuel Dumoulin (Cofidis). Nevertheless, Božič's consistency was rewarded with overall victory in the points classification, where he finished with 79, four more than the runner-up Niko Eeckhout (Bel) of An Post – Sean Kelly. 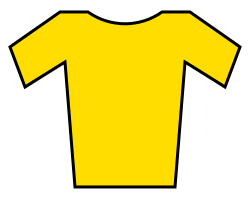 Božič's next result of merit was a 12th-place in the 204 km East Flanders classic, Omloop Het Nieuwsblad, where he arrived in the first chase group, 18 second in arrears of eventual race winner Juan Antonio Flecha (SKY). Unfortunately, the 2010 season was ultimately a quiet one for Božič, and he did not score a major victory like in the previous year's Tour of Spain (1st, stage 6). Božič at the 2012 Tour Down Under. "Due to the crashes Božič couldn't follow up to a start in the Giro and get the results he was aiming for in the season. However, after the Giro we made plans with Božič. We decided he would firstly compete in the Tour of Luxembourg to build him up for races and then we agreed the Tour of Switzerland was a race that would help him get some good results in the Tour de France. The plan is coming together nicely." Božič finally returned to the winner's circle at the UCI WorldTour with a dramatic and emotional victory in the fifth stage of the Tour de Suisse. There, Božič crossed the finish line in tears after having countered a daring move by his Italian team mate Marco Marcato in the final kilometre. Second behind the 30-year-old Slovenian after the 204 km trek from Huttwil to Tobel-Täegerschen was Spain's Óscar Freire, with the Slovak Peter Sagan of Liquigas in third. "My last [big] win was in 2009, a stage in the Tour of Spain and even today I hadn't expected to do so well. I told my teammate Marcato to attack in the last kilometre because I felt a bit rough and that, if he couldn't make it, I'd try for the sprint. We were lucky it all worked out. I've had a very difficult last six months, no wins and never really feeling good on the bike. Today I thought it wasn't my day either but, with 50 meters to go, I got on Freire's back wheel, then got past him at the last possible moment." Božič's win gave added impetus to his push for a coveted spot on Vacansoleil's Tour de France roster, which would mark the Slovenian's 1st appearance in the French grand tour. He has already competed in both the Giro d'Italia and the Vuelta a España. Božič joined Astana for the 2012 season. In October 2015 Cofidis announced that Božič would be part of their squad for 2016. 1 2 "Astana signs Borut Božič and Kevin Seeldraeyers". VeloNation. VeloNation LLC. 19 September 2011. Retrieved 1 January 2012. ↑ ""PEZ Talk: Vacansoleil Fastman Borut Bozic," Joe Papp and Ed Hood, ''PEZCyclingNews,'' August 8, 2010". Pezcyclingnews.com. ↑ Richard Tyler (26 September 2009). ""Bozic extends contract with Vacansoleil," Richard Tyler,". Cyclingnews.com. ↑ Brecht Decaluwé. ""Flecha fires solo shot for self and Sky," Brecht Decaluwé". Cyclingnews.com. ↑ ""Borut Bozic wins a difficult bunch sprint in Switzerland," ''vacansoleildcm.co.uk,'' June 15, 2011". Vacansoleildcm.co.uk. 15 June 2011. ↑ Star sprinters thwarted in Switzerland (15 June 2011). ""Surprise victory for Bozic," Sky Sports, ''skysports.com,'' June 15, 2011". Skysports.com. 1 2 Reuters (15 June 2011). ""Slovenia's Borut Bozic breaks down in tears after Swiss stage win," Reuters, ''guardian.co.uk,'' June 15, 2011". London: Guardian. ↑ "Team Cofidis Announces Its Final Roster For Next Season". Orbea. 16 October 2015. Retrieved 7 November 2015. Wikimedia Commons has media related to Borut Božič.